…there must be compounds that [have been] pivotal in history, compounds without which the development of human civilization would have been very different, compounds that changed the course of world events. And, they chose well from the plethora, both natural and man-made, of compounds that influence our daily lives. From the story of molecules responsible for voyages of discovery (of course greed and money play their supporting roles in the the spice trade) to the mexican yam that led to the cultural revolution of women in politics and beyond (say hello to Enovid & norethindrone); not to mention, phenols and the “Age of Plastics,” dyes, wonder drugs (did you know about the connection between aspirin and heroin? ), and how that daily fix of caffeine played its own role in the opium wars. 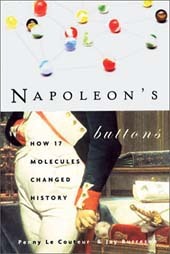 More than anything, this book tells stories: stories of chemistry, stories of history, stories worth reading.